Smartphone Nokia Lumia 800 has a plastic housing and is available in 3 colors: black, purple and blue. Inside it has a processor 1.4 Ghz single-core Qualcomm MSM8255 Snapdragon, memory - 16 Gb, camera 8 Megapixel, Carl Zeiss optics, LED flash, autofocus, F2.2, 3.7-inch display. A distinctive feature was the presence of TV output and maps Nokia Maps. There is also support Wi-Fi, Bluetooth and GPS. 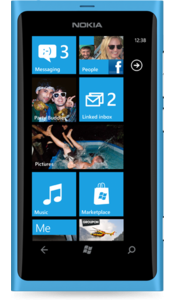 Additionally, the Nokia Lumia 800 qualitatively implemented support for the global social networks such as Facebook, Twitter, as well as the Russian social network VKontakte.